Now that we’re into the month of October and the temperature is cooling off, I decided I’d experiment with growing some herbs inside. When I lived in Seattle, I was able to grow several herbs year-round. I had big bushes of rosemary that never died off. My herb garden was on the side of the house which kept my thyme and oregano plants pretty well protected. I’d lose the cilantro, basil, and dill, but I had some basics to get me through the fall and winter months. Here in Albany, the cold climate chases away most of my herbs at first frost. Most return in the spring, but even some of the perennial herbs don’t survive our harsh winters. Rosemary is definitely grown as an annual in upstate New York. I love cooking with fresh herbs, but can’t bring myself to pay $5 for a plastic container holding a small bunch of wilting “fresh” herbs. I have decided to take action and experiment. For my first experiment, I decided to buy a set of little pots at JoAnn Fabrics. I love shopping at JoAnn’s. These pots came as a set of 3, for $8.99 and were an additional 50% off! I filled them with a little potting soil and then simply took my shovel and divided sections from my herbs that are growing outside. I have no idea how the transplants will take, but it’s been a few days and they still look healthy. I started with Italian flat-leaf parsley, lemon thyme, garden thyme, and rosemary. I was able to dig up a small offshoot of the rosemary plant without disrupting the rest of the plant. I want to see how this works and then I will transplant my entire rosemary bush to a big pot. I didn’t want to do it just yet because I might as well enjoy fresh rosemary as long as I can. Once the threat of frost presents, I will transplant the rosemary along with my oregano plants. I have nothing to lose by trying it because those plants never survive the winter. So, what’s the worst thing that will happen? The plants will die, which is inevitable if they are left outdoors. There really isn’t a downside. Plus, the herbs look really cute in these little pots. I think it would make for a great table setting. 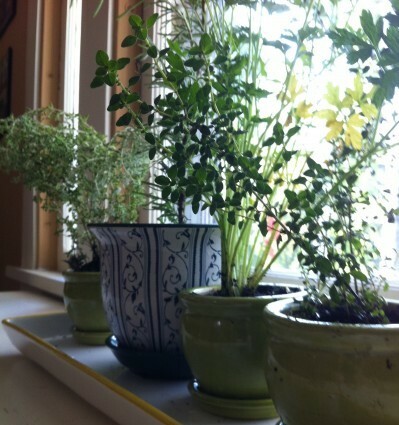 You could place a little potted herb plant in front of each place setting and your guests could take them home. This is a great idea! 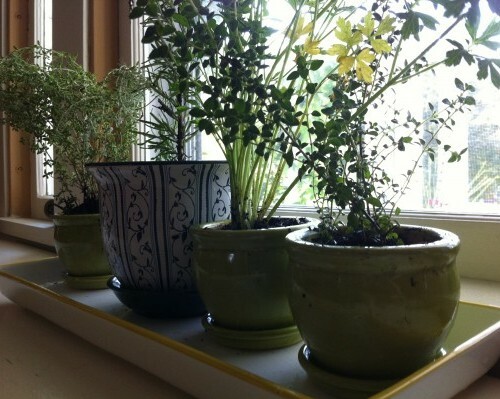 Even though I have the luxury of having a few herbs survive through the winter it would be nice to bring some inside and have continuous fresh herbs. Guess I’ll have to figure out which of my windows are south facing. Such pretty little pots! I have rosemary growing in my kitchen window. It’s perfect there because I see it all the time and remember to water it. But then again it’s fairly hardy. I did manage to kill the basil I had there. I wish Fred liked Rosemary. I sneak it into stuff as much as I can, but he doesn’t really care for it. Love having it fresh though!